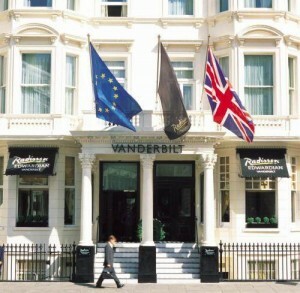 Situated on the Museum Mile, the 4-star Radisson Blu Edwardian, Vanderbilt is set in stylish South Kensington. The luxury hotel offers a cocktail bar, fitness suite and boutique rooms with free Wi-Fi. The spacious rooms have air conditioning and tea/coffee facilities. All rooms have a private bathroom and a mini bar, and each is sumptuously decorated with colourful linens and modern furniture. At 68-86, classic cocktails are served on the elegant glass bar. The restaurant at Radisson Blu Edwardian, Vanderbilt serves traditional British cuisine, using fresh seasonal produce. Room service is also available 24 hours. The grand Victorian hotel is just 300 metres from the Natural History Museum. Gloucester Road Tube Station is a 2-minute walk away, and Knightsbridge is a 5-minute walk from Radisson Vanderbilt.